Ultimate Fighting Championship (UFC) returns to the hurt business tonight (Sat., April 22, 2017) with its third straight event in as many weeks, as UFC Fight Night 108 takes place inside Bridgestone Arena in Nashville, Tennessee. 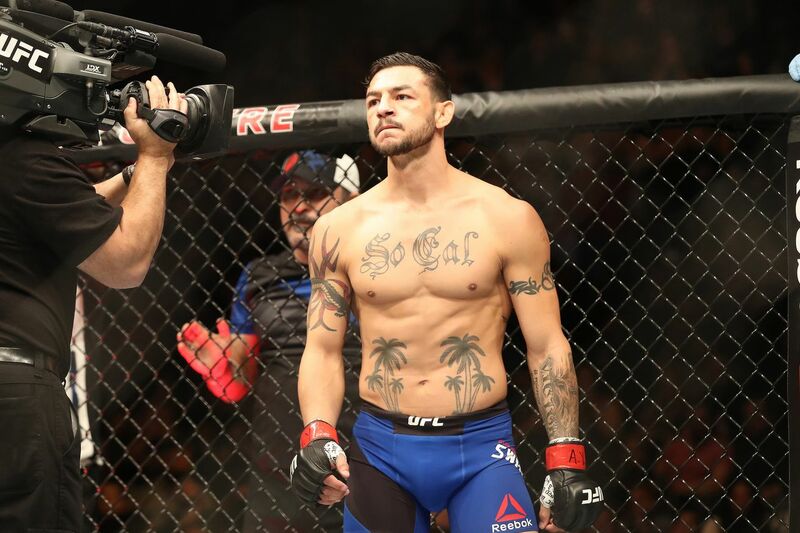 The promotion’s latest mixed martial arts (MMA) card, headlined by a Featherweight bout between Cub Swanson and Artem Lobov, will also feature a Lightweight fight between Diego Sanchez and Al Iaquinta. Who is fighting tonight at UFC Fight Night 108? Cub Swanson vs. Artem Lobov is the main event. When does UFC Fight Night 108? Today (Sat., April 22, 2017), beginning at 6:30 p.m. ET on UFC Fight Pass. Where will UFC Fight Night 108 take place? Bridgestone Arena in Nashville, Tennessee. How can I watch UFC Fight night 108? Main card start time at 10:00 p.m. ET. “Prelims” undercard on FOX Sports 1 start time at 8 p.m. ET, with Fight Pass “Prelims” beginning at 6:30 ET. Where can I get UFC Fight Night 108 updates and results? Get full play-by-play coverage and live updates here! I’ll be honest, it’s really hard to get pumped for this event, as not even the main event screams “must see TV,” especially after back-to-back events that delivered solid nights of fights at UFC 210 and UFC on FOX 24. This card is lacking in star power. And not necessarily in star power, but in intriguing fights that make sense, though we do have some decent names on the card like Jon Dodson, Diego Sanchez and Joe Lauzon. I really, really dislike the Cub Swanson vs. Artem Lobov fight for a bevy of reasons. First off, Cub is the No. 4 ranked fighter at 145-pounds, while Lobov isn’t even in the top 15. I get that matchmaking has been sporadic these days, but that’s just ridiculous. Cub admits he asked for a bigger fight, but since UFC president Dana White told him there was nothing else, he took the fight in order to get one more in before he goes on paternity leave. That said, you can’t blame Artem — who some believe doesn’t even belong in UFC — for asking for and receiving this fight. Or did he get it because of this? Jorge Masvidal and Demian Maia were set to collide at this event, but it was ultimately moved to UFC 211 — which is set to go down on May 13 in Dallas, Texas — to stack a card that was already an embarrassment of riches. Three straight, I repeat, three straight UFC events with no injuries. Life is good. Former Invicta FC Bantamweight and Featherweight contender, Cindy Dandois, is the only newcomer on the card, as she makes her debut on the biggest stage of them all to face Octagon veteran Alexis Davis. There are a couple of interesting bouts on the undercard, including surging fan-favorite Brandon Moreno, who looks to make it three in a row when he takes on the always-game Dustin Ortiz. Also Thales Leites — who lost his last bout — inexplicably earned a bout against a fighter in Sam Alvey who is on a roll, winning four straight. Plus, the prospect killer, Bryan Barberena will look to get back into the win column when he faces Joe Proctor in Welterweight action. From fighting for the interim Light Heavyweight title against Jon Jones, to losing three in a row, Ovince Saint Preux needs a win in the worst way. The hard-hitting 205-pounder will look to right his ship against Marcos Rogerio de Lima — who missed weight and was forced to cough up some of his purse money over to “OSP.” While the fight will be contested at catchweight, Ovince needs a “W” if he wnats to avoid giving the promotion a reason to hand him his pink slip. Aside from getting to see whether or not Artem deserves to crack with the big boys, fight fans get to see the return of Diego Sanchez, as he faces Al Iaquinta, who hasn’t competed for the promotion since 2015, as he and UFC haven’t seen eye-to-eye with his contract situation. Also John Dodson looks to stake his place at 135 pounds when he faces Eddie Wineland, while Joe Lauzon looks for his second straight win against Stevie Ray. Again, a lot of decent names, but nothing too big that gets me pumped, personally. But, that’s why they fight, and this underdog of a card could potentially turn out to be a good one once it’s all said and done. Right, Artem?